Voluntary administrators are no closer to brokering a deal with Karl Suleman to help repay $70 million to investors, after the collapse of two of his associated companies. Horwath administrator Paul Weston appeared frustrated yesterday that no progress had been made on a deed of company arrangement, after a meeting with Mr Suleman and his lawyers. "Karl Suleman and his lawyers were aware we were disappointed," he said. "They are aware we needed greater substance, and we need it within a week. "It's all very macro stuff," Mr Weston said. "(There's) no micro substance to it." Mr Suleman's investment scheme came unstuck after the Australian Securities and Investment's Commission obtained orders restraining him from operating it. The corporate watchdog claimed that Mr Suleman was not a licensed investment adviser, and that the schemes he was operating though his associated companies Karl Suleman Enterprises and Suleman Investments were not properly registered. Mr Weston said yesterday that he was trying to trace how the Froggy group of companies was established and to what extent any of the companies got money from Karl Suleman Enterprises. Froggy Music group is scheduled to sponsor a concert by Elton John in April 2002 concert in conjunction with Kerry Packer's ninemsn. "If it has been paid for by Karl Suleman Enterprises or investor funds, we'll certainly be looking at trying to recover the money," Mr Weston said. "The money is better off with us and investors than sponsoring anything." It's unclear how much money is involved in the sponsorship deal or whether any money has yet changed hands. Mr Weston said that he was not aware of the details of any sponsorship contracts. Earlier this week, a spokeswoman for Jacobsen Entertainment, which is bringing John to Australia, said that the recent court action and the appointment of administrators to Mr Suleman's companies would not affect Froggy's sponsorship. "As far as I'm concerned, (it's) going 100 per cent ahead," the spokeswoman said. "They have assured us that everything is OK," she said. Mr Suleman is listed in ASIC's records as a director of 18 companies, including 10 Froggy companies. Just days before ASIC took action, Mr Suleman placed Karl Suleman Enterprises and Suleman Investments into voluntary administration, after receiving advice from his barrister Tim Moore SC. ASIC has frozen the assets of both Mr Suleman and his wife, Vivian. These include planes, a $5 million cruiser and residential and commercial real estate. The voluntary administrator has extended its search for assets to the Solomon Islands and the US. FROGGY.COM founder Karl Suleman will meet with voluntary administrators today in an effort to create a rescue package aimed at paying back creditors to two associated companies some $70 million. Mr Suleman is facing pressure to come up with a workable plan ahead of Monday when Horwarth Chartered Accountants, voluntary administrators to Karl Suleman Enterprises and Suleman Investments, will hand its report to the NSW Supreme Court. Mr Suleman placed the two companies into voluntary administration two days before the Australian Securities and Investments Commission (ASIC) obtained orders freezing the assets of both Mr Suleman and his wife Vivian. ASIC alleges Mr Suleman and his companies are not licensed to give investment advice and that the investment schemes he was operation were not registered with ASIC. It is believed Froggy Holdings, of which Mr Suleman is a director, owes monies to Karl Suleman Enterprises and that a rescue plan could involve the recapitalisation of Froggy Holdings. Up until now there has been no firm package put forward. Other proposals could include debt forgiveness, time delays, equity in other companies and profits from the Froggy Group. "He can put a proposal together to pay a number of creditors but he will need some debt forgiveness," administrator Paul Weston said. He added that in the past few days hundreds of creditors had called in relation to their investments and a "significant proportion" of those said they would not require the debt to be repaid. Most of the investors in the investment schemes were from Sydney's Assyrian community. FROGGY.com founder Karl Suleman prided himself on giving to the Assyrian community, but yesterday it was clear he had divided it. In an at times rowdy meeting, more than 750 creditors to two of Mr Suleman's companies squeezed into the auditorium at Revesby Workers Club in Sydney'S west as administrator Paul Weston explained the state of their investments. Mr Suleman, a 40-year old Bagdad born entrepreneur from Sydney's south-west was little known outside his community until a number of high-profile charity events which saw him seated next to former US presidents Bill Clinton and most recently George Bush. On November 12, after advice from his barrister Tim Moore, Mr Suleman placed his companies, Karl Suleman Enterprises and Suleman Investments, into voluntary administration. The action came two days before the Australian Securities and Investments Commission froze his assets and those of his wife Vivian after a tip-off from investors. ASIC alleges Mr Suleman and his companies are not licensed to give investment advice and that the scheme operated by Mr Suleman and entities associated with him is not registered with ASIC as required under the Corporations Act. Investors claim they were told that for every $25,000 they invested they would receive $4000 a month for the next three years. "The companies had no ability to, at that point (when voluntary administrators were appointed) to pay all its investors and creditors," Mr Weston said after the meeting. Although Mr Suleman, who has surrendered his passport pending the outcome of the ASIC investigation, did not attend the meeting, he had many vocal supporters. This was despite creditors being told his investment schemes had caught up with at least 1600 investors owing them up to $70 million. Amid occasional cries of "Karl, Karl, Karl," one creditor asked if Mr Suleman could be a creditors' representative on a yet-to-be-formed committee to liaise with the voluntary administrator. Another was just as supportive. "Most of us know from what kind of a family he is from and what a kind-hearted bloke he is." But despite the vocal and rowdier supporters behind Mr Suleman, there was a strong element who were against him. A vote to establish a committee to liaise with the administrator was overwhelmingly in favour of independent representatives, rather than those from churches and community groups. Some creditors said they were concerned the churches and groups had been beneficiaries of Mr Suleman's donations and would not represent the best interests of all creditors. The administrator will meet some creditors on Friday to select seven representatives to sit on a committee to help disseminate information to the community. It is also believed that there have been no talks with the Australian Taxation Office about the scheme at this time. 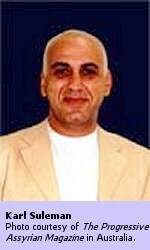 In response to the question of whether the Assyrian Universal Alliance (AUA), through its local chapter in Australia, is in any way connected to the Karl Suleman Enterprizes investment scheme (KSE), I would like to assure those who are concerned that the AUA has no involvement whatsoever with K.S.E. Mr. Karl Suleman has provided all Assyrian organisations whether social, political or religious with his generous donations and has supported all these organisations as a representative of our community and also has extended his assistance in non monetary ways. AUA received an invitation from the Froggy group of companies, as sponsors of the fundraiser dinner for the Westmead Children Hospital at which the guest of honour was the former U.S. President Bill Clinton. It was certainly an honour for our delegates to be seated in the company of one of the most influential world leaders. However, more importantly this was an opportunity for us to present President Clinton with a submission on the Assyrian situation. In this regard at the direction of Senator John Nimrod we requested that Ms Suzy David prepare and present the submission. President Clinton received the submissions and promised to consider the Assyrian issues and pleas therein. Despite her very busy work and community schedule, Ms Suzy David spent an entire week working until the early hours of morning preparing a seven-page submission together with numerous pages of selected Assyrian attachments. In presenting the submissions Ms David also raised the question with the President that where he to continue life as a private citizen would he please convey the submissions to other forums wherein the Assyrian situation may be made the subject of appropriate discussion and discourse. The Assyrian Universal Alliance and the Assyrian Nation are proud of what Ms. Suzy David has achieved for the Assyrian people, both in Australia, the United Nations, and in the International arena. She has been a pioneer in representing our nation in more than four United Nations meetings in Geneva, and has achieved much by her voluntary assistance to our people in Australia. For more than 20 years she has been instrumental in the progress of our Assyrian society and our community organisations, serving as a volunteer and has donated large sums of money directly and indirectly by providing free legal services. Suzy David has served as an adviser to the Secretary General of the AUA for several years and was elected as Deputy Secretary General of the AUA in this year's AUA World Congress in Marbella, Spain. Ms. David's involvement with Karl Suleman Enterprizes is on a professional basis and in the course of performing her professional duties, we trust that she will do all that is ethically required of her as a lawyer, serving both the interest of her client as well as the people of our community. The information we have received is that Suzy David and the legal team for Karl Suleman in conjunction with Karl Suleman are doing all that is possible to maximise the return to all investors. We acknowledge that this is a very complex matter and we should not as individuals and as a community act in haste in our assumptions and accusations. We must be patient and allow the due process of the law to determine the ultimate result. Let us not abuse the freedom we all so enjoy and appreciate by false and destructive accusations against individuals or organisations which serves no purpose to our community. Those that enjoy the temporary satisfaction of falsely accusing the devoted members of our community will have to ultimately account for their evil deeds and ambitions. Truth always wins out and time will determine its course." On behalf of the Assyrian Church of the East in Australia and after seeking the permission of His Grace the Bishop, we would like to clarify the situation in regards to the affairs of Karl Suleman and his investment companies. Over recent weeks there has been much rumour and speculation within our community and even in the Sydney media, some of it involving the Church. There are three main areas that this Diocese wish to address. They are fund-raisers involving former United States Presidents; donations to the Assyrian Church and individual investments in Karl Suleman companies. Invitations to attend charity fund-raising functions attended by Presidents Bill Clinton and George Bush were extended to a wide range of individuals including H.G Bishop Mar Meelis Zaia and other representatives of the Assyrian community, together with Federal and State Government representatives and major business leaders. Since the functions were intended to raise money for a worthy cause, namely the Westmead Children's Hospital, we saw no reason not to join the other community leaders present at those charity functions. 2. Karl Suleman's donations to the Assyrian Church and other charities. As many of you know, Mr. Suleman has been a generous contributor to Assyrian community and religious organisations both in Australia and overseas. The Assyrian Church of the East in Sydney, received the following generous donations from Mr.Suleman. (a) One used Coaster Bus (21 seater), to the value of A$18,000.00, to be used by the Church Sunday School, the new St. Hurmizd Assyrian School and Assyrian Senior Group. (b) A donation of A$25,000.00 was made to the Church building fund in Melbourne. Mr. Suleman made other donations to sister Churches in Sydney and abroad. (d) Mr. Suleman generously donated to the Church a 5% share in the Froggy ISP company. He also donated a similar share (10%) in the new company to a Jewish charity. Because the school was not registered at the time, Mr. Suleman, unknown to His Grace, registered the donated shares in the name of the Bishop in TRUST for the school. We would like to stress that neither the Assyrian Church of the East, the school, or any church leaders have directly or indirectly received any dividends or benefits from the donated shares. It should also be clearly understood that no funds from the Church or church leaders have ever been invested in any of Karl Suleman's companies. It was purely a one-way traffic. Mr. Suleman was keen to assist with the most historical and significant project ever undertaken by the Assyrian Community in Sydney - the founding of the first Assyrian Private School in the western world. The Church accepted his donations in the generous spirit in which they were given. However, we know that many members of the Assyrian community are now facing financial hardships, as the result of investments in the Karl Suleman companies. We are now seeking to clarify the Administrators' position on monies donated to charities. If they advise us that those monies should be refunded and used for the benefit of investors we will of course do that immediately. It is also important to note that the Church in Sydney recently acquired a bank loan of A$1.6 million to finalise the School construction program and we now expect that it will be officially opened at the end of January 2002. 2. Investments in Karl Suleman companies. In regards to the Church of the East involvement, IN ANY WAY, with the Karl Suleman companies we must stress again that there has simply been NO participation, investments, promotions or support directly or indirectly towards those investment schemes. Our thoughts are with those many individuals in the community who stand to lose so much as a result of the financial problems associated with the investment companies. It is time for our community to unite and think rationally in an effort to find solutions that will help our people to overcome their pain and suffering. It is not the time for recriminations and baseless rumours. We are a strong and proud community. The Church is determined to do what ever is needed to protect the integrity of both the church and her members. We will not allow the good name of the Church to be defamed and members of the congregations can resta ssured that we will take what-ever legal steps are necessary to protect the reputation of the Church." The Progressive Assyrian is fortunate to meet one of our most successful young achievers, Mr. Karl Suleman. The first thing that will strike you when you meet Karl, is his honesty, simplicity and kind nature, even though he is a highly intellectual person. Karl is a well reknown person, not only for his support and generosity towards our people, but also for his support to all our organisations. Karl is an intellectual and a successful entrepreneur, who, in a few years, has climbed the ladder of business success in Australia. His name is shining not only in the skies of Fairfield, but of all Australia, and we believe that in the near future, it will reknown in the whole world. Karl is married to Vivian Emmanuel and they have two children, a daughter Elda and son Emmanuel. Karl is known to his friends as having a heart of a lion, shared his success with his fellow compatriots and has helped almost every Assyrian organisation in Sydney which sought his help. Karl has not only helped the community here in Australia, but has extended his helping hand even to Northern Iraq, where Assyrians live in poverty and under the UN sanctions. The Progressive Assyrian sincerely thanks Karl and wish him and his family an even more prosperous future. Karl was born in Baghdad - Iraq in 1961, and he comes from a well known and respected family. His late father Mr. Emmanuel Suleman, also known as �Ammo Altayar� was a second lieutenant flying officer in the elite Iraqi Air Force. The late Emmanuel graduated from British Royal Air Force in 1958 and became a squadron leader of the MIG 17 in Iraq. He was married to our well known lady �Najeba Gewargis� in 1960. The late Mr. Emmanuel Suleman died in an accident, while parading Mig 17 in 1963. The Assyrian community in particular and the Iraqi people in general lost one of its beloved and courageous sons. He was praised by the Iraqi hierarchy and the Iraqi media for his bravery. Karl emigrated to Australia with his mother Najeba in 1975, and settled in Fairfield. Karl completed his studies in Australia and obtained his HSC at Fairfield High School. Karl is a multi-talented and business-minded person. He is an experienced businessman and has interests in communications industries, including Internet and Mobiles. TPA: Karl Suleman is not only known and respected in our Assyrian Community, but the name is now well known in business world. Could you enlighten our readers, as to how did this venture and success into business world come about? Karl: Persistence, commitment and honesty are the ingredients of success. I am by nature a very optimistic person. I believe that whatever you inspire to achieve, will be reachable if you have the determination, commitment and belief in your capabilities and the faith that our Lord will enlighten your path so that you will not stumble. TPA: You have a well known reputation for being an unselfish person, who generously assists our Assyrian community. Could you please elaborate a bit more on this? Karl: The most valuable treasure that I cherish and is closest to my heart, is that I am an Assyrian and proud to belong to a glorious nation. It is an honour and privilege for me to be of an assistance to my community to make it succeed and have one leadership and speak with one united voice. I believe that we are very fortunate in Australia to have many intellectual and young Assyrian entrepreneurs, who are very successful in their businesses and professions. They also carry a responsibility to advance the Assyrian case and present it to the world. TPA: What is your vision for the future of our Assyrian people in general? Karl: Our Assyrian nation, since its fall as an empire in 612 B.C, has endured tragedies, suffering, genocide, etc.. but through the grace of our Lord and the brave commitments of our forefathers, we have survived, as a nation and in recent years, have evolved into a very sophisticated society. We are more aware and active, politically, socially and religiously in the world. Our organisations with all their differences are struggling to achieve recognition in the world of today. I encourage my fellow Assyrian business entrepreneurs to participate with our people in their struggle for a better future. We must support our people through our organisations, financially and morally. TPA: In your opinion, what are the ingredients to support the Assyrian case in the world affairs? Karl: Self-denial, sacrifice, simplicity and forgiveness are the qualities that our businessmen, or politicians when dealing with our community should have. I urge all my colleagues, the business persons in particular, to support the activities of our organisations, so that our Assyrian nation once again can be recognised by the world, and have its people live in freedom, with all their ancestral rights, in our beloved homeland Bet-Nahrain. It is time that all of us, without exception accept responsibility to assist our nation in its struggle for recognition. TPA: The Progressive Assyrian thanks you sincerely for your encouraging advice. We wish you all the success for the future, and we pray God that we will have many of our Assyrian youth follow in your foot steps.